We have seen in prior posts that teacher compensation has a unique pay structure, different from that found in almost all other industries. And we have also seen that the factors that increase UCF teacher pay (years of experience and advanced degrees) have little or no relationship to student achievement. In today’s post we shift our focus away from the system of pay and look at the amount of teacher pay. 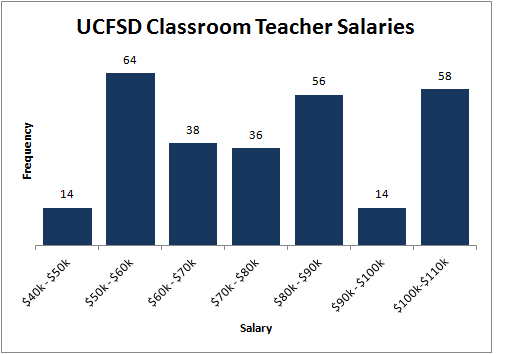 How much do we pay classroom teachers, on average, in UCFSD? If we are going to attract, retain, and reward Great Teachers, our compensation needs to be competitive. Although we are going to focus in this post exclusively on base pay, we will come back in future posts to benefits, opportunity, and work environment. As shown in the chart, our district had an average teacher salary of $75,827 in 2012-2013. Grouping teacher salaries by increments of $10,000, we can see that we have a cluster of 58 teachers earning over $100k (maxed out in step/lane grid), an even larger cluster of newer teachers earning between $50k and $60k. From the table above, we see that 79 teachers have reached the maximum step (16), and 128 teachers have reached the maximum lane. The same data is presented below as a % of the 251 total teachers. So we can see that 31.5% of teachers (= 79 / 251) have reached step 15 or 16. Finally, the same data is presented below, but this time analyzing the distribution of education within each step. In the table below, we can see that 66.7% of teachers with 1-2 years of experience hold only a bachelor’s degree. By year 7-8, we can see that almost 30% of teachers have reached the highest pay lane. And after year 9, about 75% of teachers have reached the highest pay lane. Unfortunately, it is not too enlightening to look at step/lane pay distribution. If our goal is improving school performance, it would be great to understand how pay relates to teacher performance. There are sound reasons, in my opinion, for not making performance information on individual teachers public (at least by name or any other identifying factors). So that leaves us with a relatively uninformative set of information on teacher salaries. In my next post, we will compare pay at UCF against other school districts in Pennsylvania. 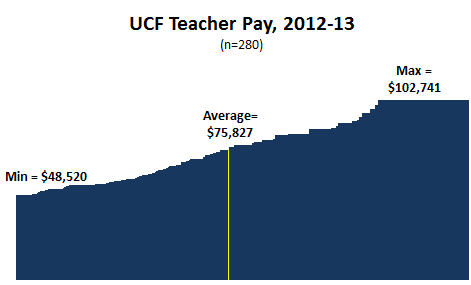 This benchmarking will give us a much better idea about the competitiveness of UCF teacher pay. This entry was posted in Rewarding Great Teaching on January 21, 2015 by Bob Sage.